Pinehurst Trace is a 55+ community in Moore County, North Carolina. Its convenient location in Pinehurst provides easy access to medical facilities, award-winning golf courses, and a vibrant downtown area. Homebuyers are drawn to Pinehurst Trace's low-maintenance homes in a private setting. It is an established community with a well-managed homeowners association (HOA). Residents enjoy private amenities where they can stay physically fit and socially active without having to travel far. The amenities at Pinehurst Trace are centered around a 7,000 square-foot clubhouse. It provides a welcoming great room, catering kitchen, and two meeting rooms perfect for hosting community parties or club activities. The clubhouse also includes a beauty parlor/barber shop, game room with billiards, and library. Residents never have to travel far for an invigorating workout because the Pinehurst Trace clubhouse is complete with an exercise room. Homeowners can also enjoy activities outside of the clubhouse with Pinehurst Trace s thoughtful outdoor amenities. When the weather is warm you'll often find residents swimming laps in the pool or lounging poolside. Residents can also enjoy a game of tennis, shuffleboard, or horseshoes on one of the outdoor courts. Pinehurst Trace is a 225-home community, and the homes are available on a resale basis. Built between 1985 and 2017, they offer two to three bedrooms, two bathrooms, and an attached one-car garage. Pinehurst Trace's homes feature main-level living and range in size from approximately 1,300 square feet to over 2,400 square feet. Residents of Pinehurst Trace pay a reasonable HOA fee that provides access to amenities and activities as well as exterior home maintenance. With chores like mowing, landscaping, and exterior painting handled by the association, homeowners live a carefree lifestyle with more time to enjoy their favorite hobbies. Within the clubhouse, residents can gather to play billiards or partake in card tournaments. Community events like catered dinners, potlucks, and trips to local restaurants are planned monthly. Whether signing up for educational and volunteer opportunities, attending a neighborhood picnic, or joining neighbors at a nearby golf course, there are numerous ways to have an active social life while living in Pinehurst Trace. 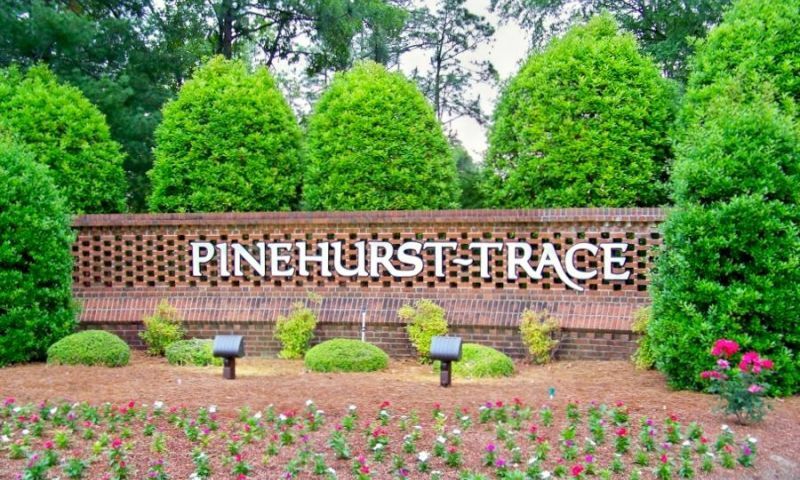 Pinehurst Trace is an age-restricted community for active adults in Pinehurst, North Carolina. An AMTRAK train station is located just ten minutes away in the adjacent town of Southern Pines. Southern Pines is a charming town filled with horse farms and a historic downtown area. Pinehurst Trace is a two-hour drive from Charlotte and Greensboro and about 80 minutes from Raleigh, Durham, and Chapel Hill. Closer to home residents are less than five miles away from FirstHealth Moore Regional Hospital, Sandhills Community College, and Moore County Airport. Golf enthusiasts will be happy to know that 23 golf courses in the area have been rated with four stars or better by Golf Digest. With an area rich in historic landmarks, unique shops, charming boutiques, and delightful restaurants, it's no wonder that Pinehurst Trace is a popular active adult community in Moore County, North Carolina. Clubhouse - 7,000 Sq. Ft. There are plenty of activities available in Pinehurst Trace. Here is a sample of some of the clubs, activities and classes offered here. Pinehurst Trace is a 225-home community, and the homes are available on a resale basis. Built between 1985 and 2017, they offer two to three bedrooms, two bathrooms, and an attached one-car garage. Pinehurst Trace's homes feature main-level living and range in size from approximately 1,300 square feet to over 2,400 square feet. Please Note: Due to the age of this community, floor plans are not available at this time. I was looking for a comfortable home I could take care of on my own near my kids in Southern Pines. I came across Pinehurst and asked some friends about it who actually did know someone who lived there. It is a really friendly neighborhood and I feel very safe living here. The mature trees are lovely and I've been doing updates on the house over time (mostly the kitchen and bathrooms). The prices are very affordable too. 55places.com is not affiliated with the developer(s) or homeowners association of Pinehurst Trace. The information you submit is distributed to a 55places.com Partner Agent, who is a licensed real estate agent. The information regarding Pinehurst Trace has not been verified or approved by the developer or homeowners association. Please verify all information prior to purchasing. 55places.com is not responsible for any errors regarding the information displayed on this website.